Our most recent gathering was at Ashmores restaurant, Radcliffe-on-Trent, on Saturday 25th November when some 60 members and partners enjoyed the 2017 Annual Dinner. Entertainment was provided by the Higgs Bosen Shanty Band who provided several pieces which we joined in, including the haunting “Wild Irish Thyme”. The Tom Taylor and Mike Pratt awards were presented. The former (for highest attendance) to Brian Bull, John Parry and Don Maltby while Garry, or as we now know, Garrick, Wright received the latter trophy which goes to the non committee member deemed by a panel of Past Chairmen, to have made marked contributions over a number of years. We were happy that Michael Bonshor joined us for the start of the 2017/18 Choir year. A summary of Michael’s achievements and interests can be found on http://radcliffeontrentmvc.org/about-us/musical-director/. Since taking up the baton in September 2017, new MD Michael has guided us in three Concerts and, on 15th November 2017, at a Service celebrating the life of Richard Cumberland, one of our long standing members. Richard’s recent death was a great loss to us as well as to his family and friends to whom we express our condolences. The choir’s last concert of the 2016/17 season on 1st July 2017 was a resounding success, in the ancient and beautiful church of St Mary, at East Leake. The church was almost full, many in the audience had heard us sing at the church before, and so returned to listen to the men of Radcliffe Male Voice Choir, and Matt Glendenning, soloist extraordinaire. His dexterity and skill with his two clarinets was nothing short of amazing and truly delightful. 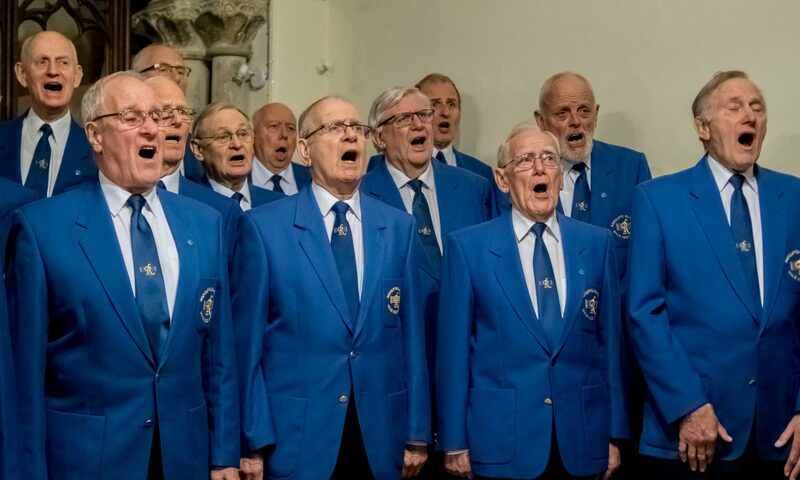 As regards the choir’s performance, a regular supporter of the choir remarked that it was one of the best concerts she had heard us sing…. and she has been following the choir for over thirty years! ​The previous concert, on 3rd June 2017, was at Sutton on Trent Methodist Church, together with soloist Olivia Caputa, another talented former Cantamus singer. This was to celebrate the Diamond Wedding of a long term choir member, Gordon Ellis, and his wife. We are happy to report that as a result of this event £1,275 was raised for their Church funds.